Editor’s Note: 10 Key Charts is now 30 Charts. Thanks for the great work. I am a newer subscriber and am already looking forward to the next report. Please add me to you regular New Observations updates. This is excellent. I clicked here via Seekingalpha and then see you reference Mike Larson from Money& Markets which is another website which offers unbias advice. Building regulations & housing supply: having lived in UK (30 yrs) and US (since 2001) the ease of erecting new buildings, the supply, is critical when observing pricing stress. While UK wins awards for price amplitude in your graph, it is hard to break ground to build there which allows small changes in demand to feed through quickly. The US enjoys looser restrictions with consequences of a more drawn out recovery. Monetary Subsidy: you note the change in the fiscal subsidy but should one consider the monetary one. the major price falls to come go beyond supply and demand of housing, the magnitude will be exacerbated by the nature of the withdrawal of the monetary subsidy. 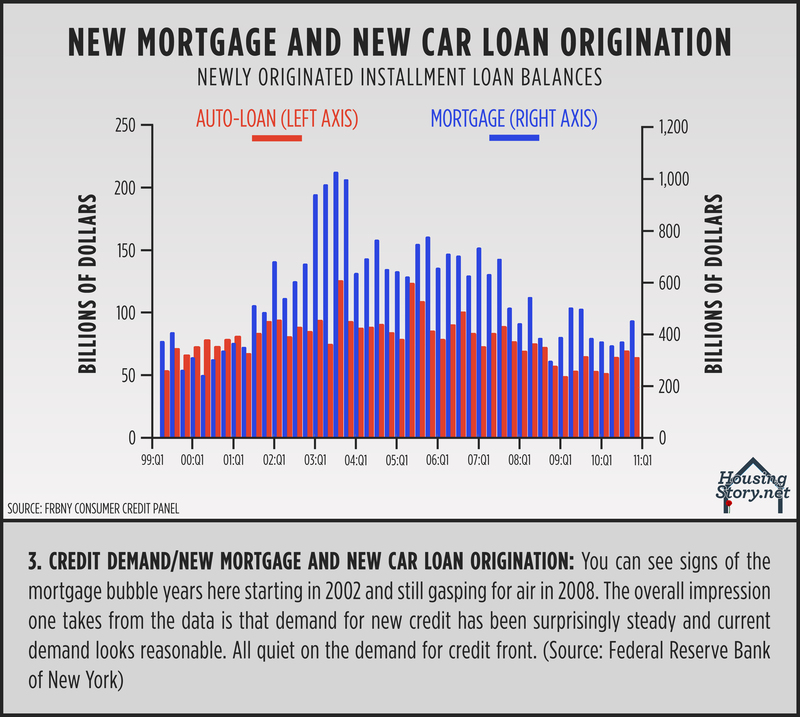 The end to purchases of mortgage back securities and decline of purchases of short term treasuries on one side and the emergence of a demand for dollar bond yield on the other will contribute in the same way as a declining salary or rising mortgage principal – an additional tax on consumers. Labor Mobility & foreclosure: the theory of seperate housing markets within the US which was proven bogus in 2006+ may yet emerge with house prices becoming more correlated to local employment levels. 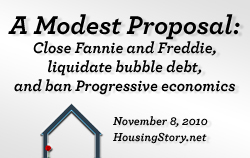 Policy wise the balance one needs to consdier is between the mobility of labor versus the consequences of foreclosure. The more onerous the aftermath of foreclosure (Fannie/Freddie getting tougher on walk-aways) the more illiquid will become the pools of labor in depressed which will delay recovery. All of which is mere wind and pontification versus your edifying statistics! Great website, thanks for your charts. I wish we have them in EU as well. Thanks Mike A lot of good information. What do you think about these policy changes to heal our economy and help prevent future economic crisis. If people are not encouaged or rewarded to create money in the inflation cycle won’t that help slow down the creation of credit bubbles. #!. Create a mortgage that fits the current economic conditions. I am proposing: A mortgage with a starting interest rate of 3% and go up 1/4% a year for seven years and cap out at 5%. The borrower must qualify at the 5% interest rate. This mortgage would be available to any homeowner that could qualify, even those people that their mortgage is underwater. #2. Mortgages that are underwater would have their unpaid balance reduced by an amount equal to 30% of their monthly payment amount each month for up to10 yrs or until the mortgage equals the then current possible sale price of the home, which ever is less. Second lien holders would be able to participate in this mortgage reduction plan. . Their interest rate and terms would be the same as the first lien holder. A modification agreement would be used. #3. Enact the Zero Inflation Taxation Policy. This policy decreases the chance of another bubble/ bust economic cycle. These polices http://www.economysflaw.wordpress.com/ will not cost the taxpayers a dime. DMW, thanks for this useful information. One comment and one question: The charts, useful as they are, don’t all look at the same period of time, so comparing some of the averages across charts are like comparing apples to oranges, or more exactly, looking at different parts of the puzzle over different time periods. As many mention and you acknowledge, all real estate is local. I have lived in Santa Cruz, California for 21 years, having never bought a home here, though I did purchase a rental duplex in Eugene, Oregon in 2004 that has been an excellent investment. Having resisted buying in Santa Cruz, I’ve felt vindicated yet horrified for others since the crash began. Now, I’m trying to time the market to see where the bottom may lie before buying. Can you recommend any Santa Cruz or Bay Area market watcher/pundit that I can read for clues on the local market? You obviously do good solid honest research. 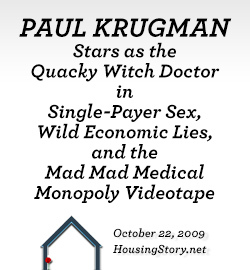 I think you would discover a whole new can of worms relating to this issue, and a very important can of worms; if you would check out Wendell Cox’s “Demographia” surveys, and Randal O’Toole’s “How Urban Planners Caused the Housing Bubble”; just for a start. Most analysis of WHERE in the USA the bubbles occurred, is being ignored by the mainstream writers. Thomas Sowell is an honourable exception. in 1999, over here (Taunus Area, Germany), the home prices went through the roof, with a 1955 house costing more than 260.000 and then gaining even more. I was then renting a flat for 800. For these 800, You could not buy anything even remotely similar. 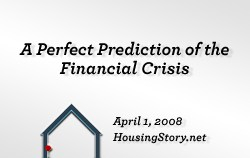 But from 2002- 2004, the prices AND the interest rates came crashing down. And so i found a 1982 brick-built house in decent shape that was being offered for the same 260000, and the mortgage for 200000 was only 800 -same as the rent – while renting a similar structure was now at 1150.
so i struck, and by now the house price is again at roughly 300.000… and with the real inflation rate being at about half the mortgage rate, the “real” mortgage rate is even lower. But BEWARE: this is only a rough rule-of-thumb, and yes, even if you use it, you might still incur losses if you *have* to sell for some reason, as there is nothing worse in real estate then having to sell! I can take no liability for it – it just worked very well for me and a few friends. I would like to share the following rule of thumb: compare the rent for a given object against a 30-year old-fashioned standard mortgage. If the rent is lower or equal to the mortgage, always rent- you are more flexible that way. As soon as the mortgage is about 10% cheaper than the rent, and you are somewhat confident you can pay back, BUY and lock the mortgage percentage in as long as possible, i.e. 30 years. This way i hit the market bottom over here quite well. I would like to know your opinion on this rule-of-thumb……. Question on the overhang part. If there are 130 mi;;ion units in the country and 7 million are delinquant, shouldn’t that be around 6% rather than 12%? I am a bankruptcy attorney in Maryland, the District of Columbia and Virginia and we also handle loan modifications. From a financial standpoint, it makes sense for many people who are behind on their mortgage payments to file for bankruptcy relief and walk away from their houses since the lenders will rarely modify the loans to the value of the houses. 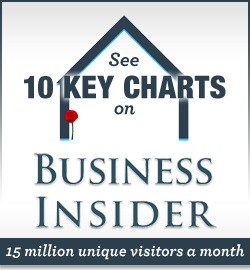 I routinely see clients that are 100k or more underwater and behind on 1st and 2nd mortgages. After bankruptcy, many could qualify to purchase a house again in as little as 2 years and come out ahead. So where would you have someone with $250k spare cash hold their money? I cant invest in real estate, because it is going to crash harder. Stocks are up one day, down further the next, so I am staying flat on stocks. CD’s are paying 3% if I lock in at 3-5 years. Gary, I don’t have any “advice” for you but I can relate some recent history. oldest, most conservative, most traditional way to store their “spare wealth”. the U.S. Mint – gold and silver coins – American Eagles to be exact. Call up 10-year gold and silver graphs and observe the 2006-2010 prices. Look back to 2004 and see where I did the same thing but not in Nevada. Hmmm, I see where the Mint is out of stock – for the third time in 12 months. You may have to wait until next year if you decide to go the traditional route. Apparently demand is much higher than expected over an extended period. then and this is now and we are quite pleased at how things are working out. Maybe in 7 to 10 years some of us will rotate back into the real estate sector. Others may want to buy some acreage for a nice little ranch. I may do both. I think I will call my ranch Downtown Austin. Want a real estate boom? Move to Canada. In Toronto prices are up 20% yoy (after doubling between 2002 and 2008) and listing your house in a good neighbourhood will see multiple offers / bidding war. Nationally prices are 7.5 times household incomes and heading nowhere but up. I am truly envious when I read about how you can buy houses for $100K in many parts of the US – that’s the 20% down on an ordinary home here! 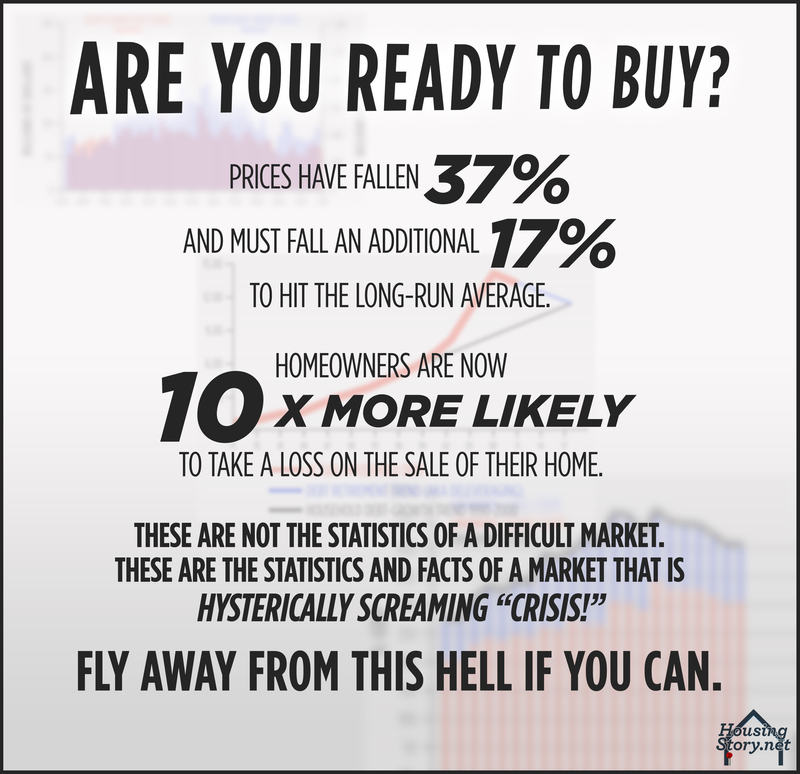 So is this in fact a good time to buy a home or not?? Some people tell me it is and my mother tells me it is not. I know this is grossly oversimplified, and the MBA’s will have a million reasons why it’s wrong, but… I have used it for years, I am not upside down, I am not filing for bankrupsy and have never defaulted on anything, and retired at 52. If the the surrounding market will support this rent, then buy it, if not pass. Simple rule… You say what am I supposed to do if EVERY property is priced way to high? My advice is SELL SELL SELL and put your money in something else and buy back later when the situation reverses. You say, that might take 10-15 or 20 years! Yup you are right. Patience, not greed always wins in the end. Great Research. As a veteran of the industry, I can tell you 2 anecdotal reasons that you are right. 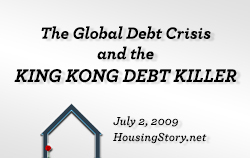 1) We (GMAC) wrote trillions of mortgage debt in Payment Option Arms. 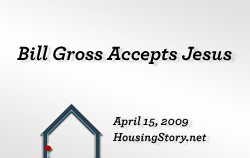 At the peak of the housing bubble in 2006, one in every 5 mortgages we underwrote were POA. Those typically have a reset of five years or 125% LTV. 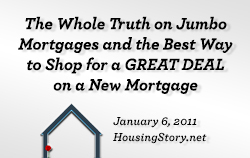 Those mortgages will be forced to reset to fully amortizing in 2011 or sooner. Foreclosure City come alive. Housing prices dive. 2) Inflation. 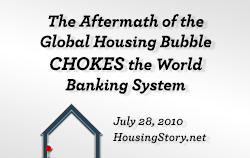 It will raise its ugly little head by 2011, after the US Gov’t and Fed run out of money to throw at mortgages. 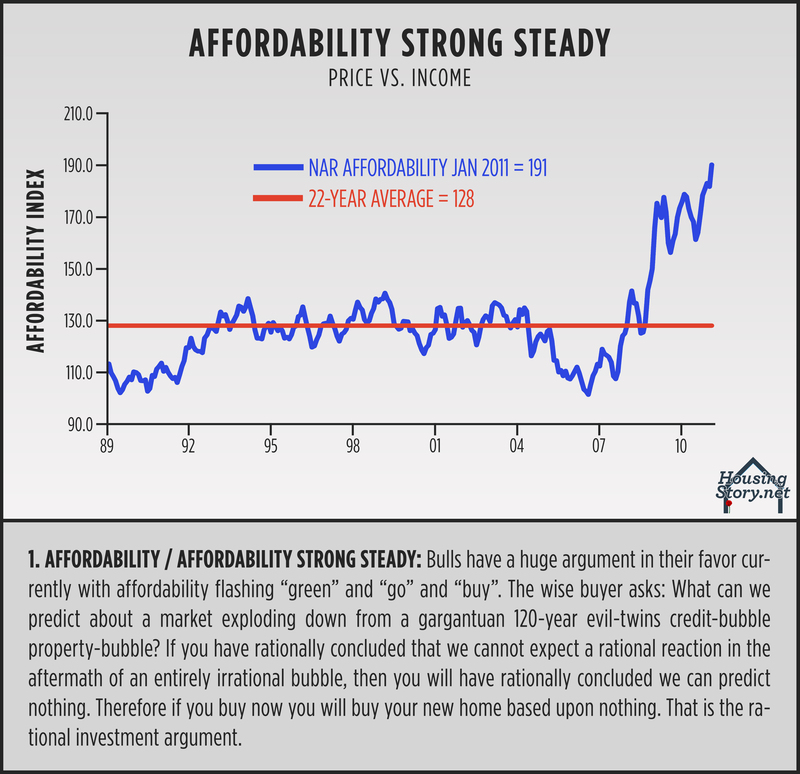 As the mortgage rates rise, the affordabilty will fall and consequently the housing prices will fall as well. I just don’t have to much hope in this U.S. market today. I’m thinking about how much work I have put into it ,and It looks as if I’m not going to get any thing in return till I,m 70. I herd of it from my grand father that people were jumping from building back in that depression. This depression is far worse and does not look too, or sounding to get any better until 7 yrs from now. home to a lot of people will be a casket. crash market.. Thank you for the Grate American dream I got to live for. you are right. We are very much underwater on a good sized rental property. As long as our 2.5% interest only 2nd mortgage doesn’t go up and as long as vacation rentals keep up, we can make our payments. But it would be so much easier to walk away and have all of that cash to put in something else. This is on top of our losing 3 businesses during the downturn. The only problem with all your graphs is that they do not break markets down locally. For example, in Las Vegas, the inventory has shrunk so much that prices are actually going up in some categories. Condos that were selling for $100k are now up about $5k. Nevada State law now mandates that a lender must agree to mediate with a court appointed mediator before foreclosing, providing that the borrower applies to the court. This has slowed foreclosures. Rumor is that B of A is developing a rental program for their foreclosures in Vegas which, f true, will deplete inventory further. 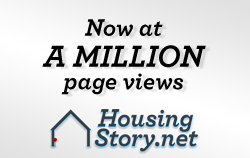 There are multiple offers on a great percentage of listings out here and lots of cash buyers. Rental income for investors is higher now than mortgage payments. I’ve been a full time Realtor for 24 years. This crash is my third. With the number of foreclosures out there, rentals are in demand. Afterall, when Joe 6 pack walks away from his house, he still needs somewhere to live, right? Every crisis provides opportunity and this one is no different in that respect. Pingback: The worst is not over yet in housing… « Elevate8 – The LIFE you were created to LIVE! There’s so much evidence suggesting the pressures that caused the world to blow up in 2008 haven’t ceased. Maybe we don’t have another bank blow-up, but that’s only because the banks either no longer exist or are fully supported/owned by the US government. Meanwhile, regional banks are failing every day. The only/easiest way out of this? Inflate asset prices. Sooner or later, enough money will be printed to generate enough inflation to prop up house prices. The fundamental issue is debt. The debt outstanding today is basically the same or higher than what we had going in to the crisis. The Government can mint money without debt. In fact, current law allows the Treasury Secretary full discretion to mint platinum coins in any amount and denomination. If he wanted to, Geithner could order the creation of a million dollar coin and produce thousands of them per day, funding the entire Federal Deficit with Seignorage. This would be inflationary, but inflation is the only way out of the current mess. 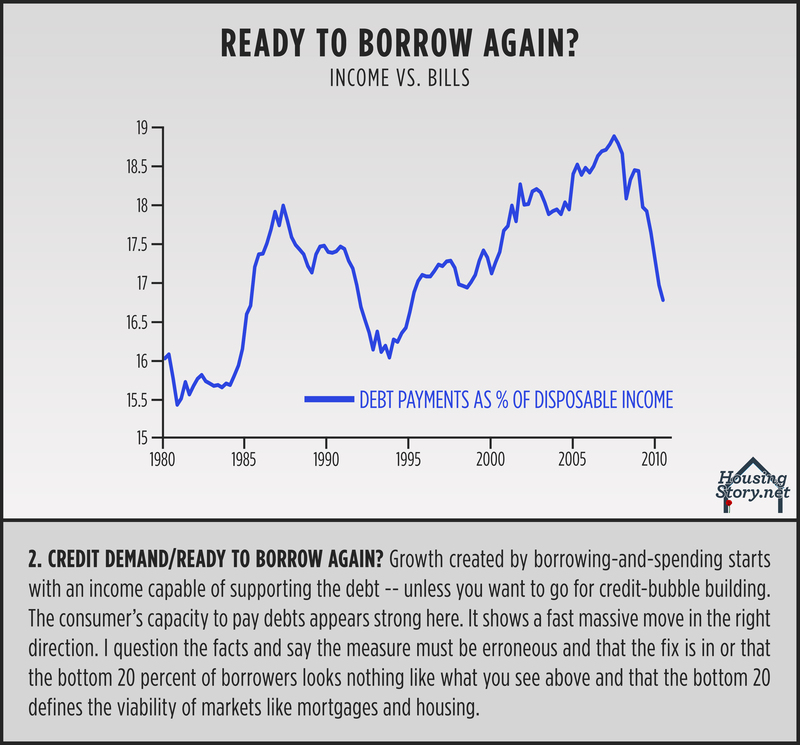 A full general wage and price inflation would allow borrowers to repay debt in cheaper dollars and reduce the total debt load. The big problem with doing this is of course energy costs. Most energy is imported, and inflation there causes a huge financial leak. Do you have charts or sources for information that will show me how much of the mortgage market was government funded/secured over the years? I am trying to see links between the rise in Fannie Mae, Freddie Mac, and Ginnie Mae mortgages as a percentage of total mortgages and the current value of the properties financed. Thank you. I appreciate the information you have shared here. 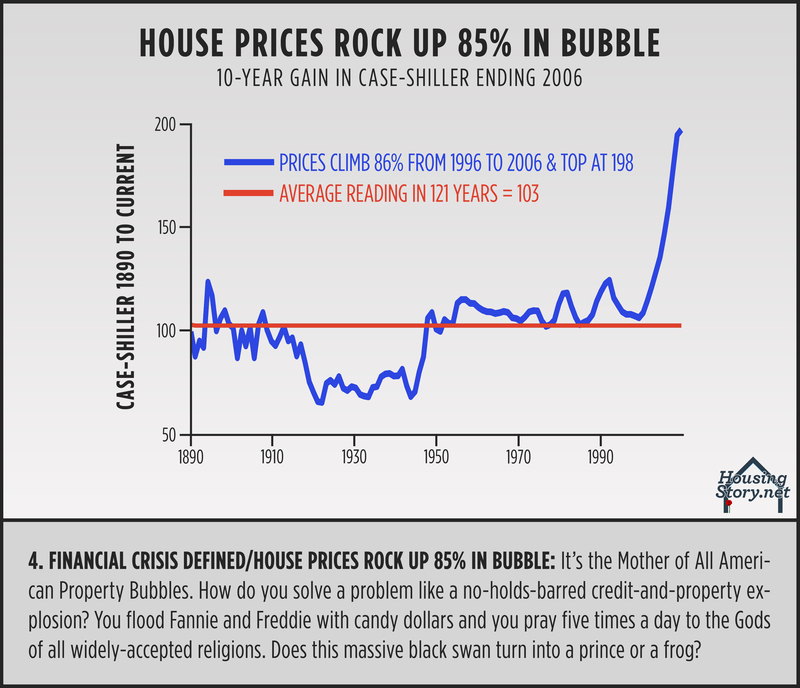 The best work out there and it’s all in graphs: An Overview of the Housing and Economic Crisis – and Why There Is More Pain to Come by T2 Partners LLC. Excellent information. I’ve been a real estate broker/investor for over 30 years. I’ve lived through four down markets in real estate and this one is the worst. The bigger the boom…the bigger the bust! Everything tends to revert to the mean. Buyer beware…the risk/reward ratio appears to be skewed much more to risk than reward. if you look at these graphs, it’s hard to recommend a purchase right now. Thanks Michael. This is good stuff. I posted on this again, with all due credit tossed your way. I’ll be discussing this on my next radio program (my next book will probably include this stuff too).